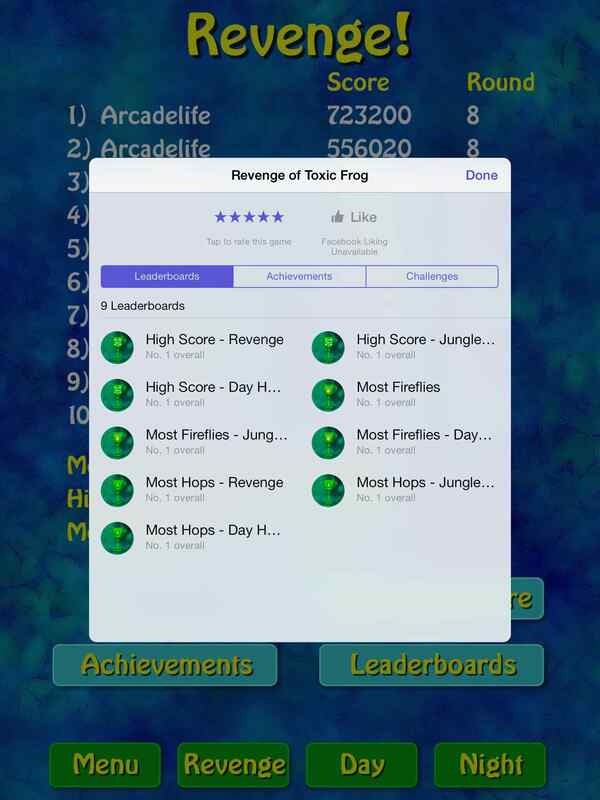 Here’s my guide to Revenge of Toxic Frog (iOS/Universal) or, more accurately, my guide to achieving the highest score possible in that game. Getting a very high score, reaching and passing the 500,000 milestone (and earning the Arcadelife Cup achievement), relies on one thing: combos. Specifically, it relies on being able to string together a constant sequence of firefly captures without missing any at all and without dying. I’ll tell you how the combo system works, the base scores for each type of firefly and the best levels to exploit for the highest score possible, as well as some tips for staying alive and maximising the combo multiplier in the time available. The base score is the score you will get for landing on a firefly with the combo multiplier at 1. The normal firefly has a base score of 100. Each successive normal firefly that you land on – without any hops between fireflies – will increase your combo multiplier by 10. This means that the second firefly that you collect will have a multiplier of x10, giving you 1000 points for that firefly. 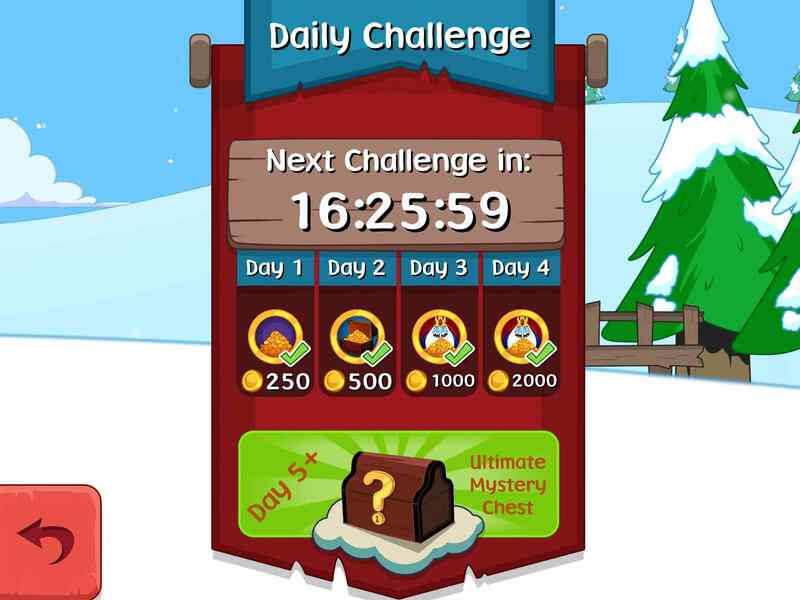 The next one will have a multiplier of x20 (2000 points) and so on. An unbroken sequence of normal fireflies will give you a score that increases as follows: 100, 1100, 3100, 6100, 10100, 15100, 21100, 28100, 36100, 45100, etc. 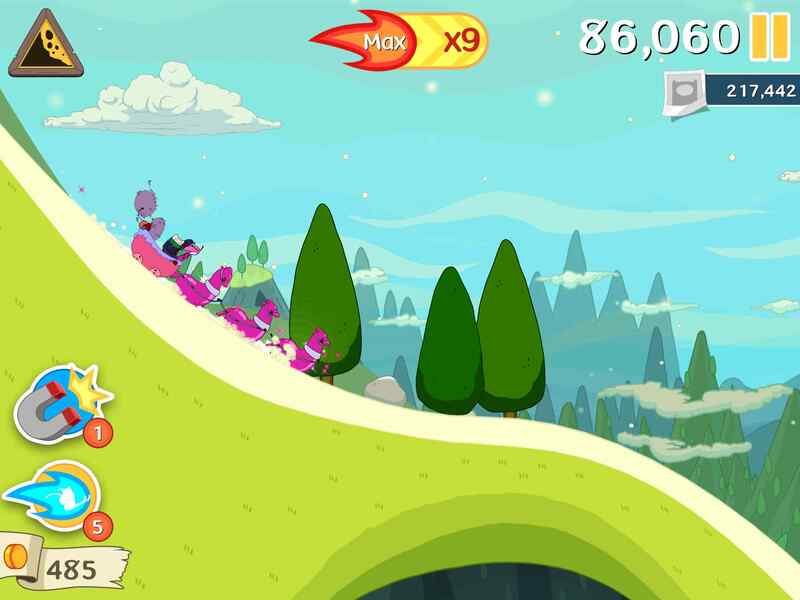 The key to really huge scores is building the score multiplier up to over x200. Green fireflies have a base score of 1000. They also temporarily give your frog the ability to hop to any visible lily-pad on the screen. Green fireflies are a great help with high scores for two reasons: their base score is already 1000 and they will give you the chance to reach a firefly that you would otherwise have been unable to reach, speeding up your combo building. Additionally, they do not break your combo streak when the hopping power-up wears off. They first appear on level 7, which is worth knowing if you plan on incorporating them into your scoring strategy. Note that collecting a green firefly with a score multiplier at x200, for example, will instantly increase your score by 200,000 points. Purple fireflies have a base score of 1000. They grant your frog temporary immunity from yellow fireflies, enabling you to collect those for a short time, much like the power-pills in Pac-Man. This sounds like a great way to score high, but there is a big catch: When the purple firefly’s immunity wears off, the combo multiplier resets. I always avoid collecting purple fireflies, preferring to wait for them to return to the normal state before grabbing them, unless I encounter one when I have less than 15 seconds remaining and my multiplier is at least x200. Otherwise, you’re throwing your combo multiplier away in exchange for whatever you manage to score while the immunity power-up is active. 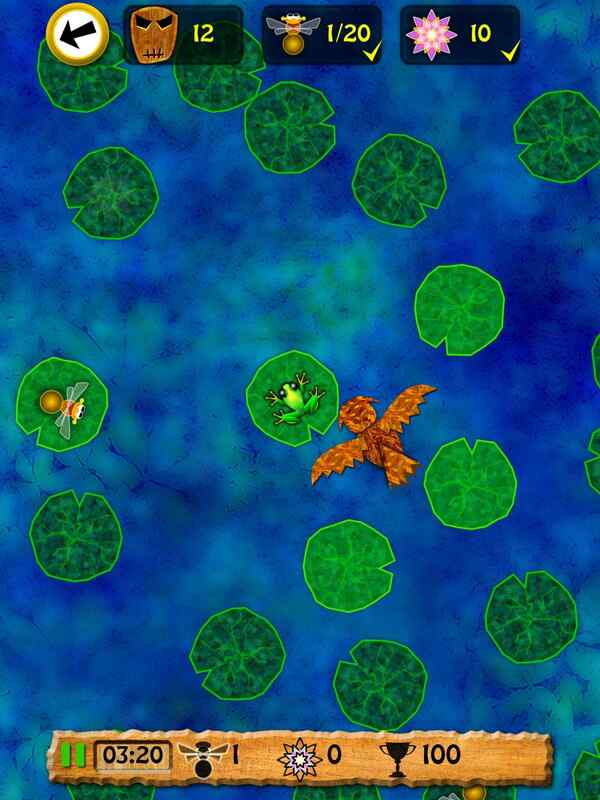 Yellow fireflies can only be collected while you have the purple firefly immunity active. 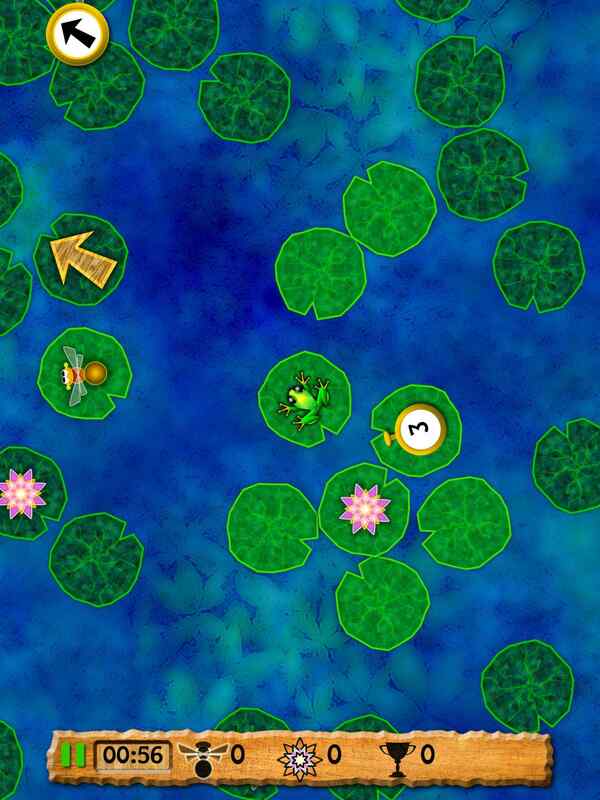 The base score (yellow firefly collected while immunity is active and combo multiplier is reset by 1 or more non-scoring hops) is 2000. 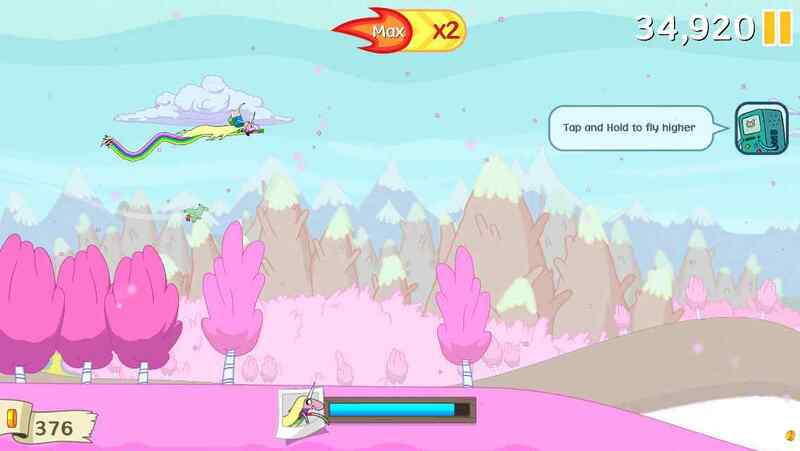 If you manage to get your multiplier to at least x200, then pick up a purple, then pick up one or more yellow fireflies in sequence before the multiplier resets, you will achieve an impressive score. It isn’t something that you can plan for, but you need to be prepared to go for it on the rare occasion when the situation arises. 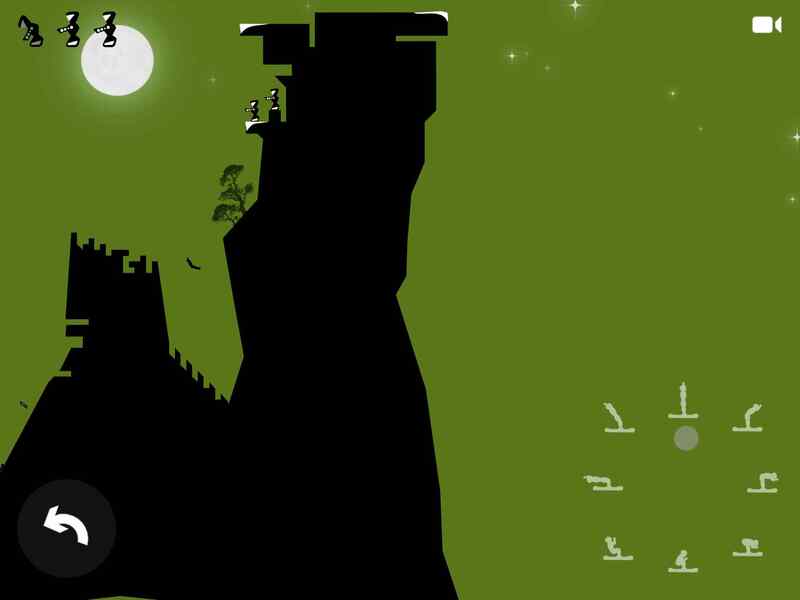 Levels with owls – forget it. 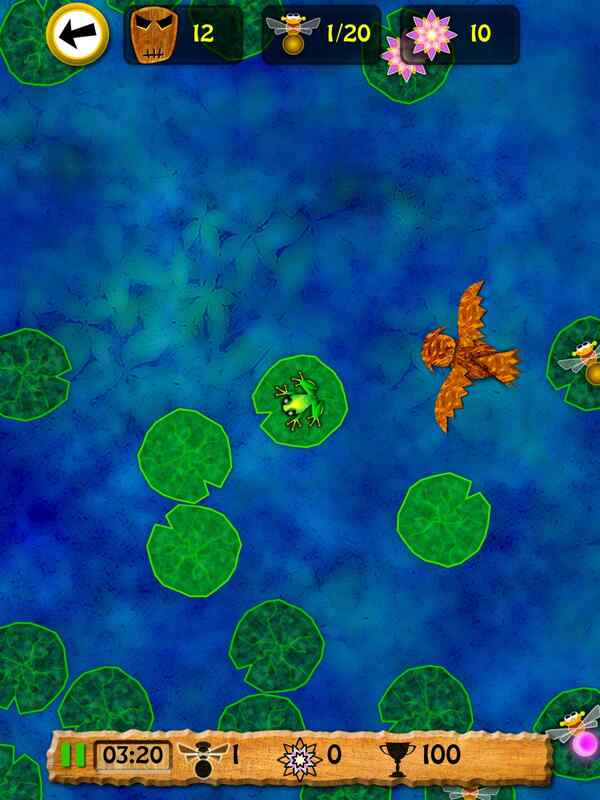 The owls fly around the screen, killing your frog instantly if they pass over it. 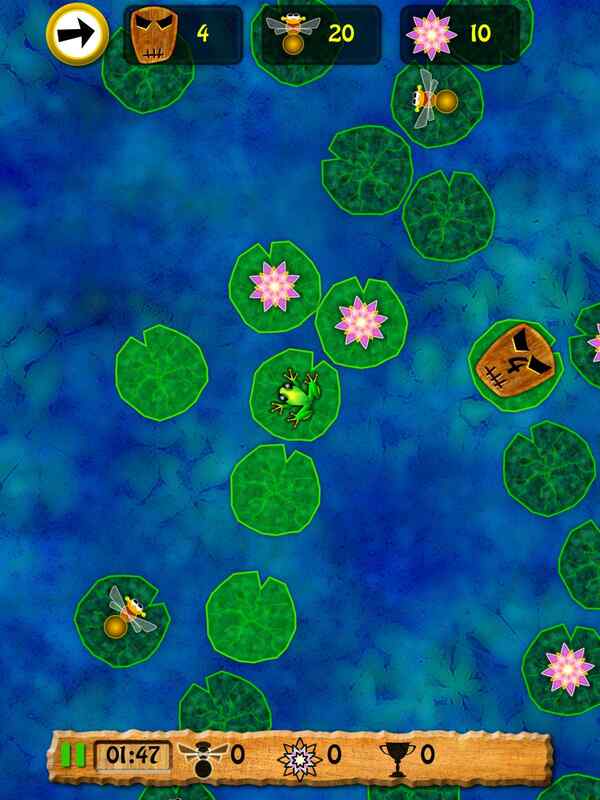 This is a hopeless situation if you are camping on a lily-pad waiting for a firefly to float past. Levels with the Toxic Frog(s) – almost guaranteed rage as they will hop onto your lily-pad and kill your frog when they float within range. Levels with Tiki bombs. Don’t even bother. The levels with giant catfish are fine because you’re only ever going to be hopping to lily-pads with fireflies on them. Catfish will never appear on the same lily-pad as a firefly. Best level for early high-score chasing: level 2. 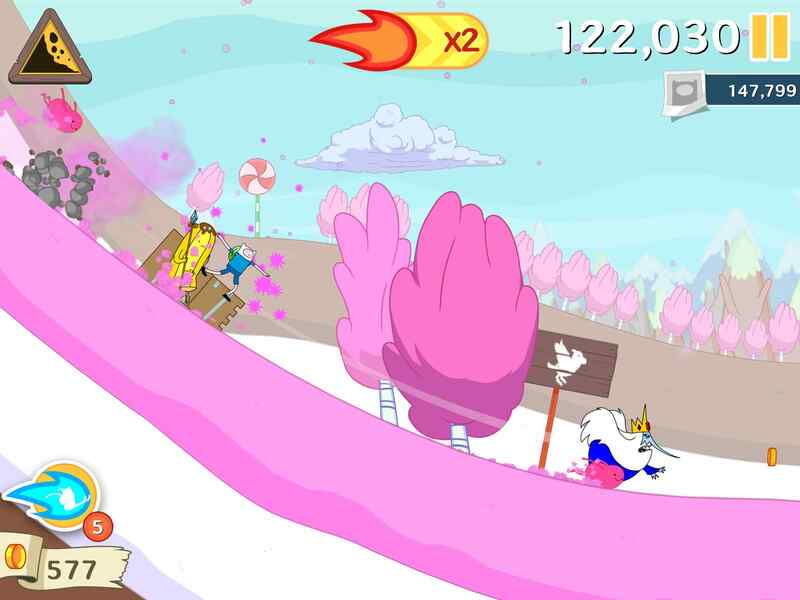 This level is perfect, apart from the relatively short amount of time available. 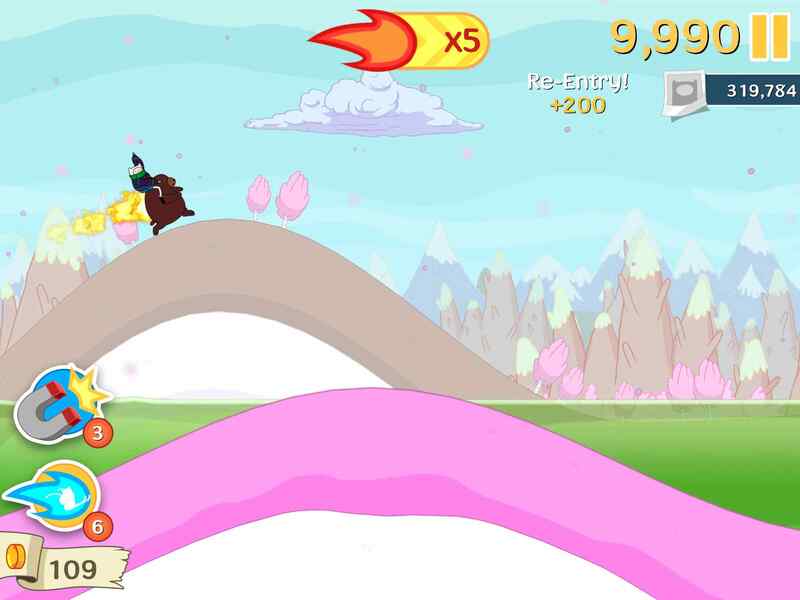 Scoring over 500,000 is possible, it just requires a lot of patience and a purple firefly very near the end of the timer. 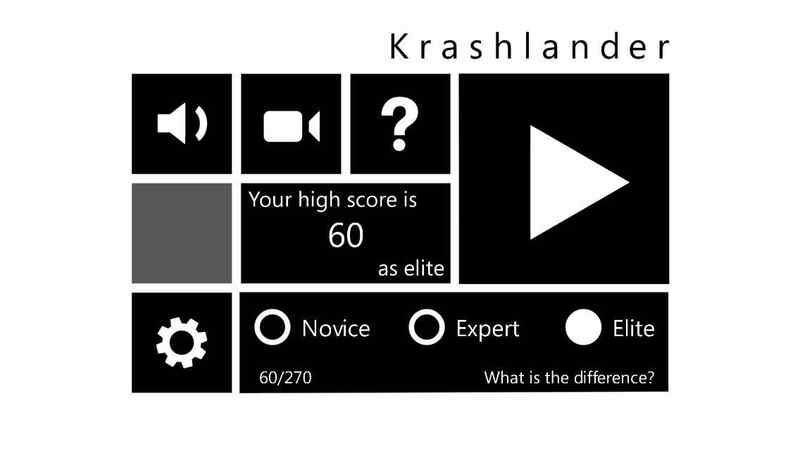 Best overall level for high-scores: level 8. Time available: 02:35. There are catfish, but no other hazards apart from the yellow fireflies. There are also green fireflies which can contribute to massive scores. I finally managed to break the million point barrier on level 8. 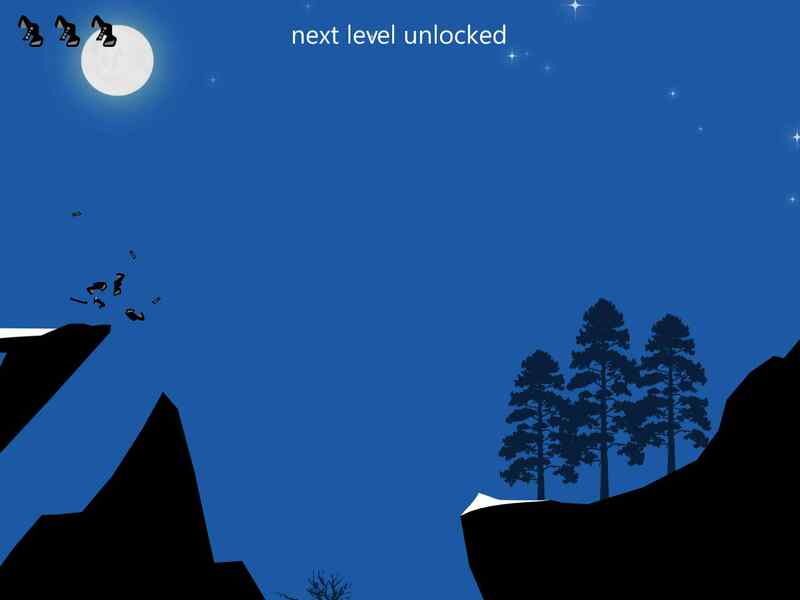 Level 7 – If you prefer the night levels, 7 is reasonable for high-scoring but you have 10 seconds less than level 8 and the stars seem to take up a lot of the lily-pads. It’s worth noting that the score multiplier only affects firefly scores. Collecting stars or flowers will always give you the same base score, it will not be multiplied by your combo multiplier. Now all you have to do is get the game and you can be just as tragically obsessed as I am. Once again I appear to be really good at a game that hardly anyone else plays. 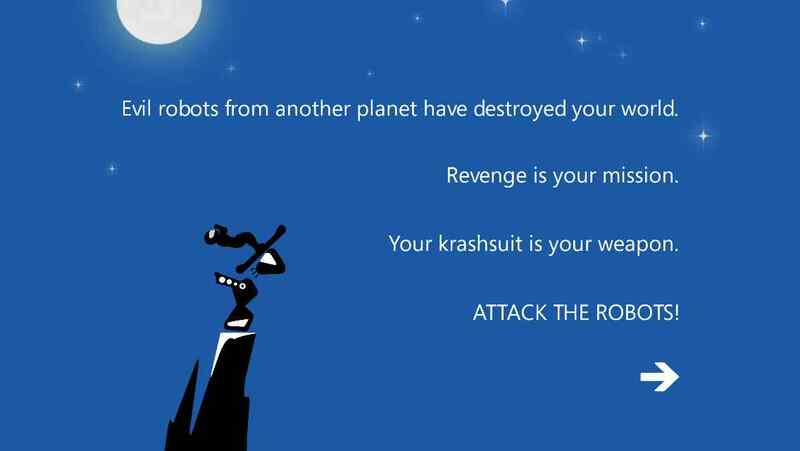 Ninjaboy, Rocket Warrior, Coverfire, the original Toxic Frog and now Revenge of Toxic Frog. After being involved with the game before it was launched and then playing it every day since its release on the app store, I finally broke the million point barrier today. 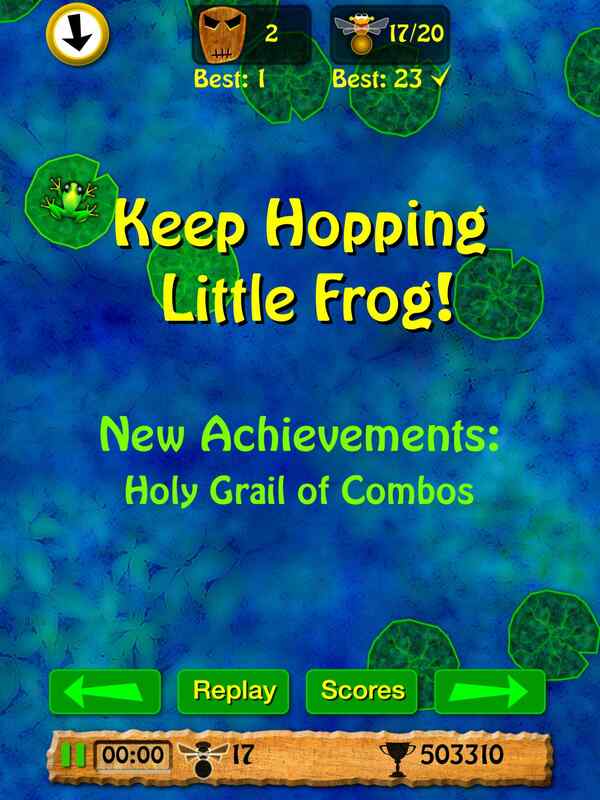 10 word description: Lily-pad tapping, frog-hopping, high-score chasing amphibious sequel. 10 word review: I loved the original; this beats it in every way. 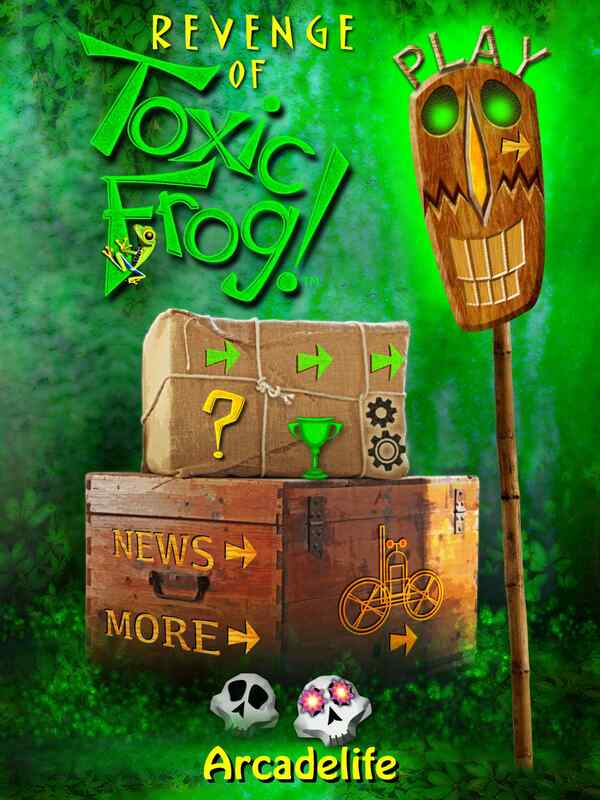 You will like this if you enjoy: Toxic Frog. Oh, but of course, you never played it because you were all too busy playing some other games that could only dream about being half as much fun as this one. Sorry, but it’s true. The good news: It’s ****ing brilliant. Presentation, graphics, controls, gameplay, challenge progression, addictive qualities, sound effects – the whole thing is about as close to perfect as you can get. I started figuring out some scoring techniques and I lost a couple of hours. Those were great hours, the kind of hours you recall years later when everything else is just a blur of mediocrity. Oh yes, and it runs fine on older devices, e.g. iPad 1. The bad news: There’s still a glitch with the ‘best hop count’ display. It’s hilarious because I spotted this when the game was in beta and I was sure it had been fixed. It’s not a problem, the hop count registers correctly on GC, but I found it mildly amusing to see it come back again. Sorry Keith, I had to mention it. There’s nothing else even remotely bad about this game! Arcadelife verdict: I’ll get the obvious admission out of the way first: I helped test this game, gave the developer a laugh with my insane high-score chasing and now the final version has an achievement that acknowledges this site and my scoring obsession – The Arcadelife Cup – which you get for scoring more than 500,000 points. Now, I’m not just giving this game a glowing review because I was involved with it before it was released, I got involved with it because I fell in love with it as soon as I spent a few minutes on the first beta version I saw. It absolutely deserves a glowing review. It deserves to be bought, played and played some more. I was sent a promo code; I didn’t use it. I bought the game even after spending a lot of time on beta versions because I really, honestly love playing it. Revenge of Toxic Frog is a great game, truly wonderful. 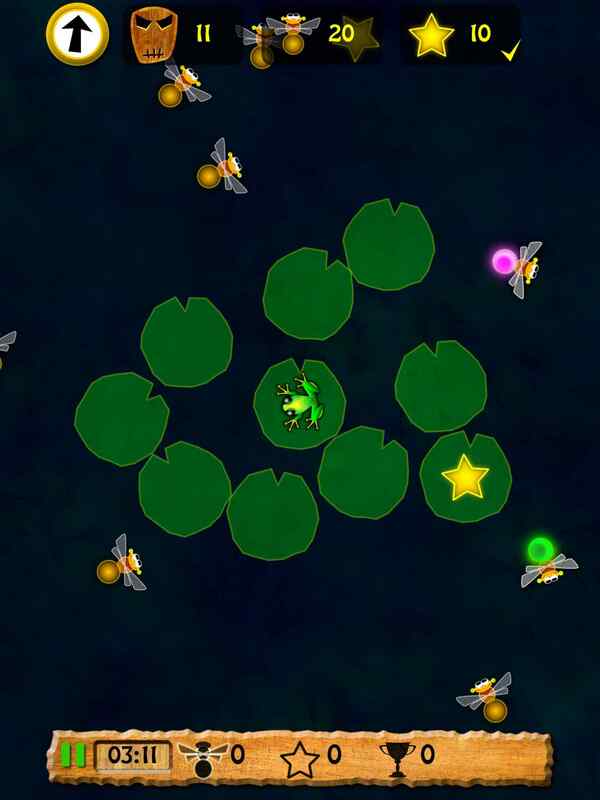 It eases you in with a deceptively simple single-touch tap-to-hop control method but, around the halfway mark, the levels begin to present the kind of challenge that inspires heroes to rise up to defend the planet. Playing the game normally, meeting the objectives of each level, that’s a lot of fun. Applying some creative thinking to the scoring, seeing just how far you can push the combos, the subtle complexity of that is pure genius. There have been other games that I have found, loved, reviewed highly and have then been generally overlooked by the rest of the world. That’s always a shame, extremely so in this case if that’s the way it turns out. If it’s any additional incentive, nobody is getting anywhere near my Game Center high score and I like how that feels. 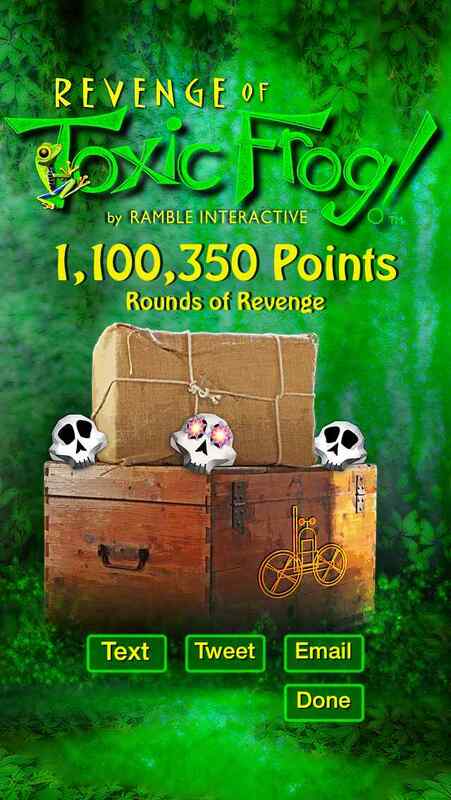 Go on, buy Revenge of Toxic Frog, bring your adequate gaming skills over to the lily pond and let’s see how good you really are. Arcadelife’s 500th review was typed on a Das Keyboard Model S mechanical keyboard – check them out, they’re really rather groovy. Exciting, isn’t it? I bet you can’t wait. 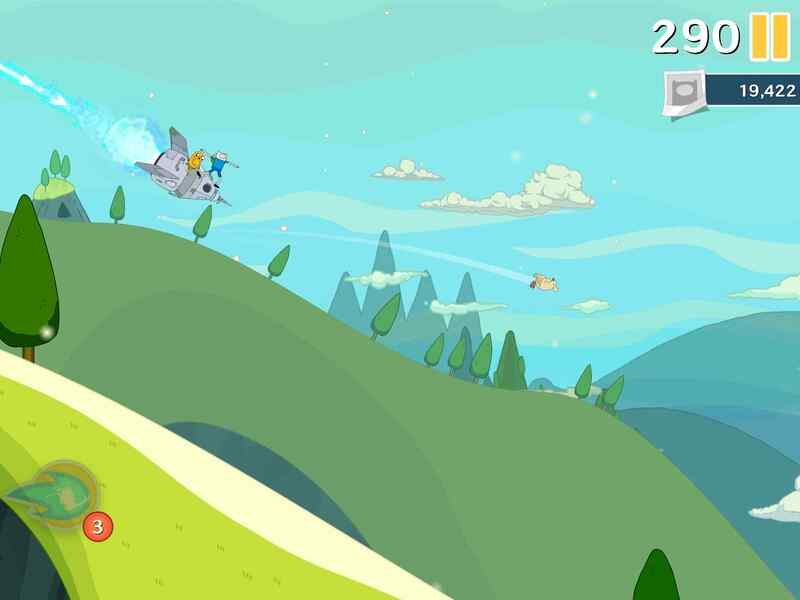 10 word description: Physics skier vs alien robots. Ragdoll crashing is your weapon. 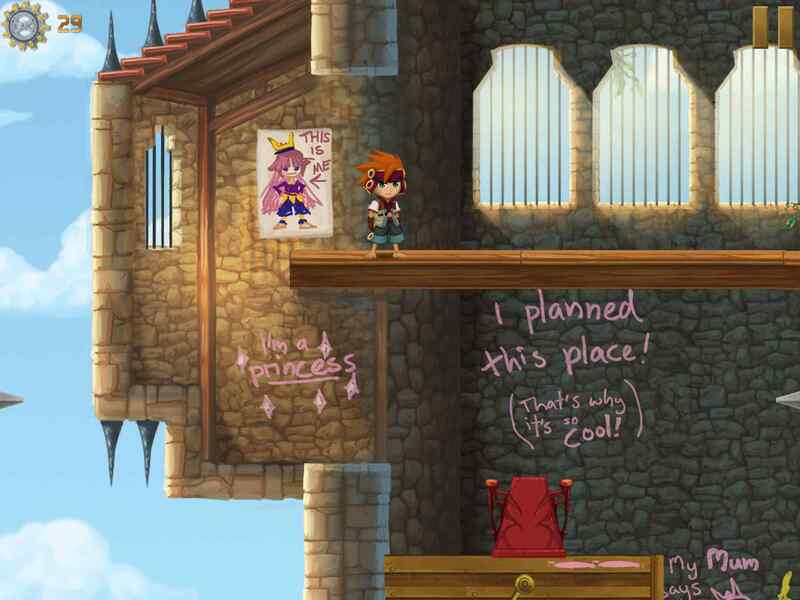 10 word review: An old game I just found – liked enough to review. The good news: Clean, attractive graphical style. Performs well on older devices (i.e. iPad 1). Controls are good once you figure them out. 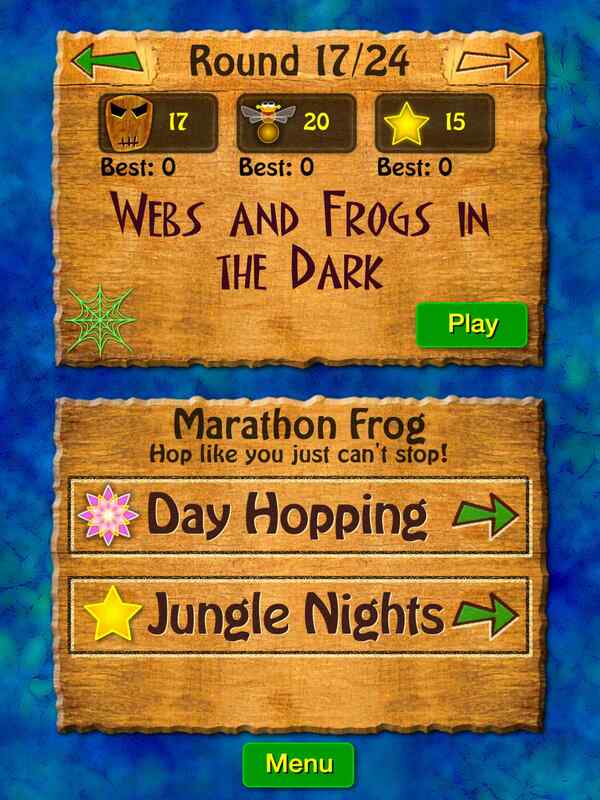 Very user friendly, with the option to skip a level being offered if you appear to be struggling. The bad news: The controls, although actually very good, could be a little too complicated for some players. 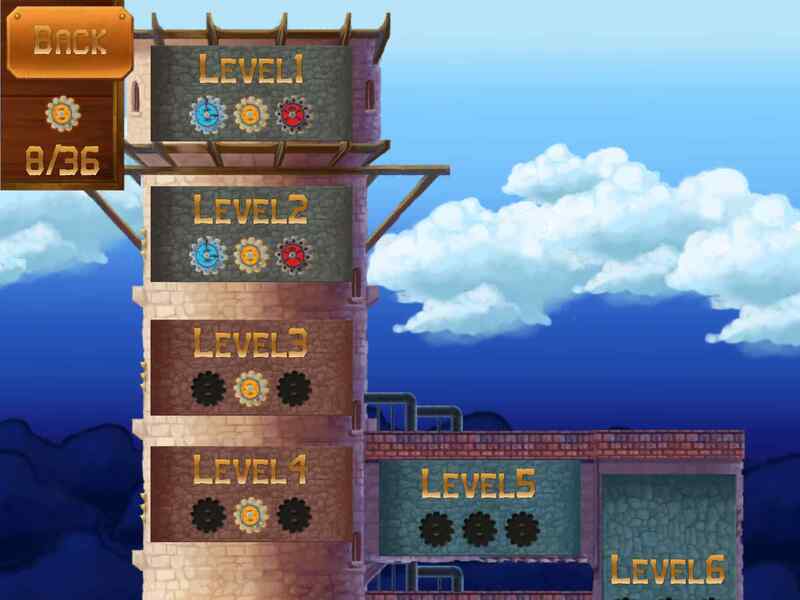 Small number of levels. No Game Center. No sync between devices. Arcadelife verdict: It’s different enough, polished enough and enjoyable enough … there just isn’t really enough of it. 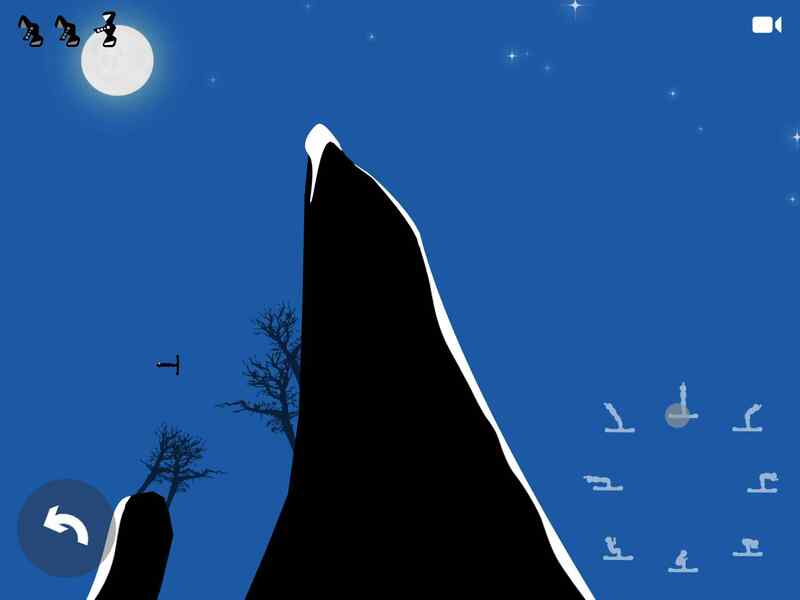 More could have been made of the skier’s ability to dislodge boulders and other objects, which seems like a massively missed opportunity and the number of levels is quite small. Overall, what is there is fun and well worth picking up if you like a bit of stunt skiing mixed with physics based target destruction. 10 word description: Retro platformer. Downward scrolling levels. 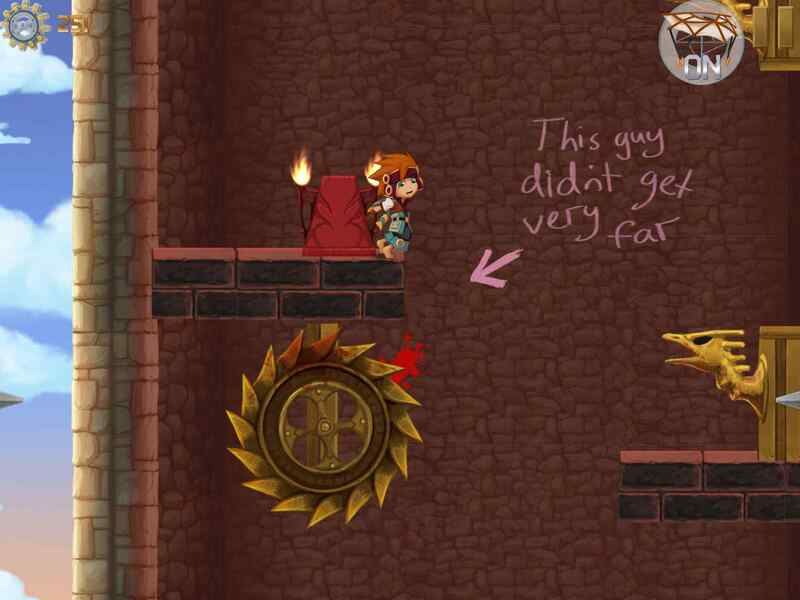 Traps, obstacles, collectibles, dark humour . 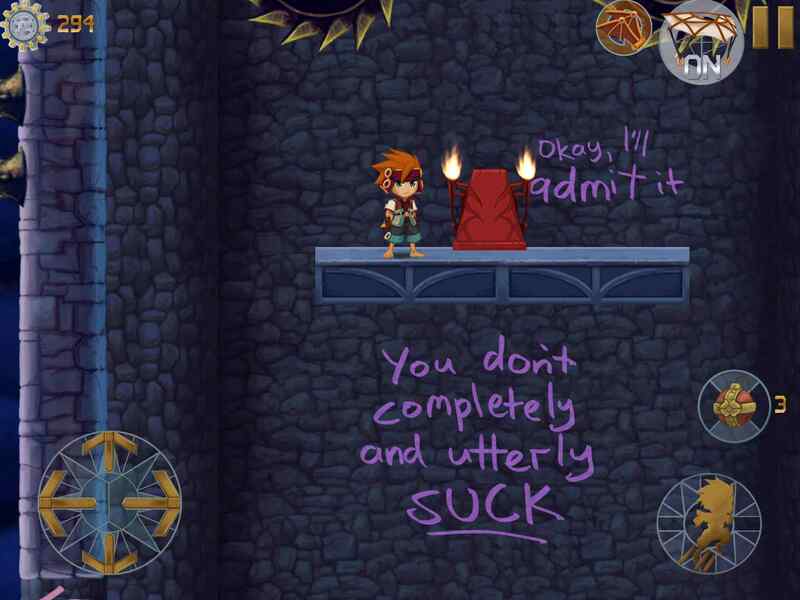 10 word review: Proper game with no IAPS. And it’s very good. Rejoice! 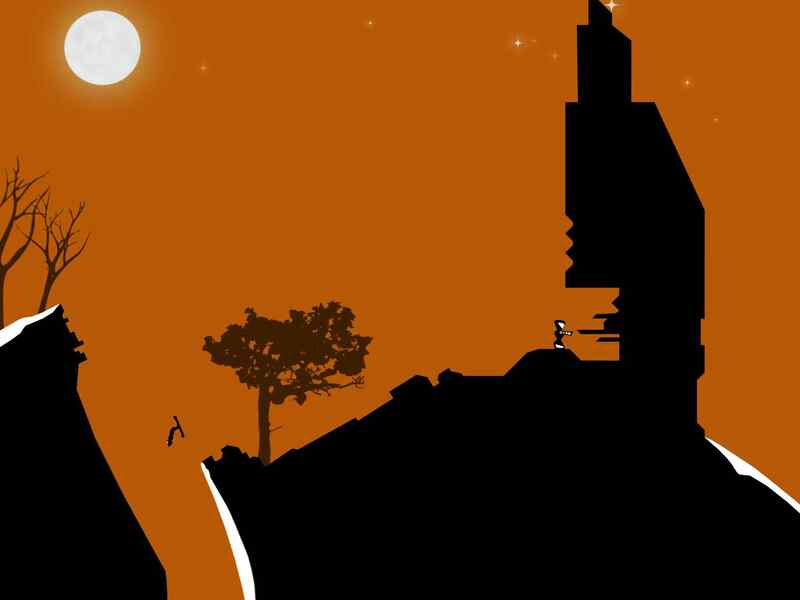 You will like this if you enjoy: Platform games. A darkly amusing story that unfolds via the (rather demented) ramblings scrawled on the wall by your tormentor – a princess who doesn’t need saving. The good news: Graphics and overall presentation – very nice (it has been ported from a PC game and appear to have retained all of its beauty). A choice of controls – both systems work very well and one option should suit you, depending on your preference. Level design, while not staggeringly original, takes the downward progression and does plenty with it, without it feeling gimmicky or unnecessary. Level ratings (based on number of deaths, cogs collected and time) do not impede progress but also give you a reason to go back and try to improve, if you feel like it. 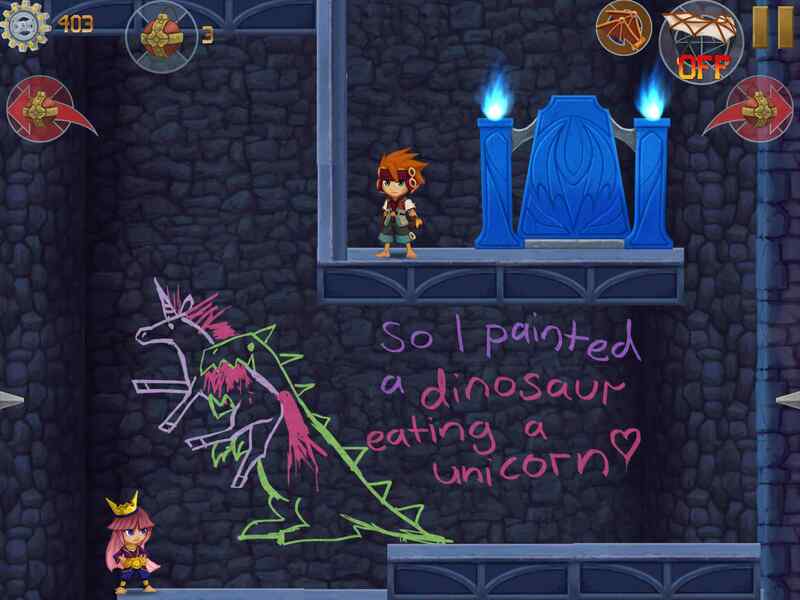 The story unfolds nicely via the wall writing and the humour actually works, which is nice. Plentiful checkpoints. 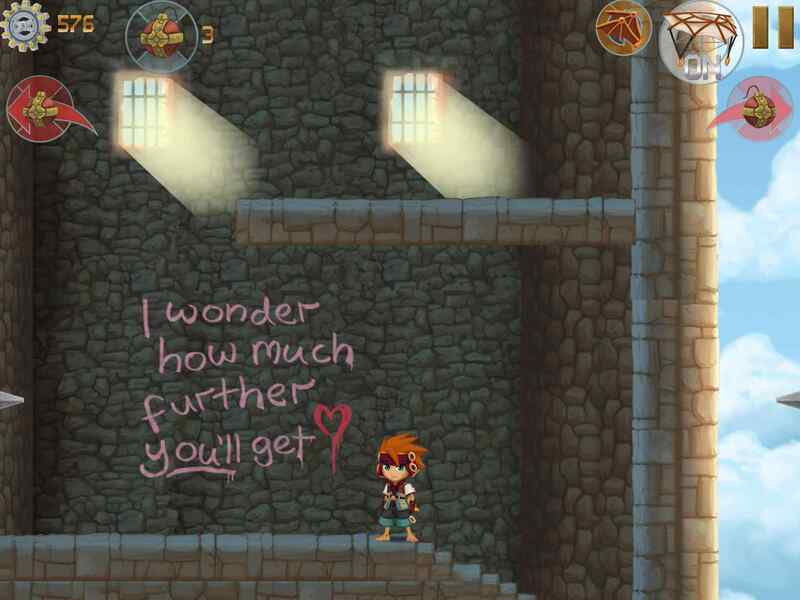 The bad news: As usual, the experience is slightly less wonderful on the smaller screen (iPhone / iPod Touch), with some of the wall writing being very hard to read. No cloud sync between devices. Also, I would have called the game Go Down For The Princess. Arcadelife verdict: First of all, this is NOT one of those disposable, generic iOS games where you are constantly falling and you have to avoid hazards and collect items. 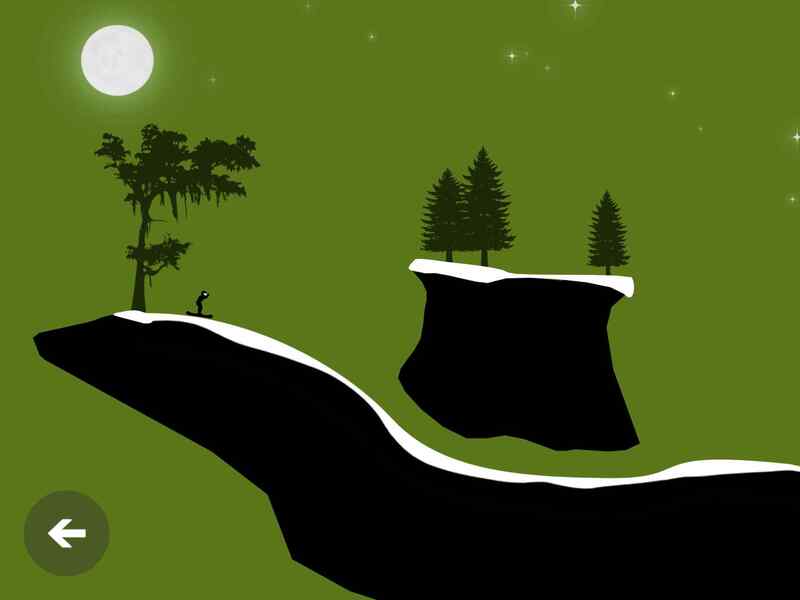 This is a proper platform game where the general direction of your progression is downwards… and you have to avoid avoid hazards and collect items. It isn’t a native iOS game, it has been ported from the PC/Mac original, and it has all the feel of being a premium touch-screen title without any of the usual downers such as purely existing as an excuse for IAPs. There are no IAPs. The game is fun, a lot of fun. Deaths can be frequent in certain areas but there always seems to be a checkpoint exactly where you need one and reload/restart times are barely noticeable. 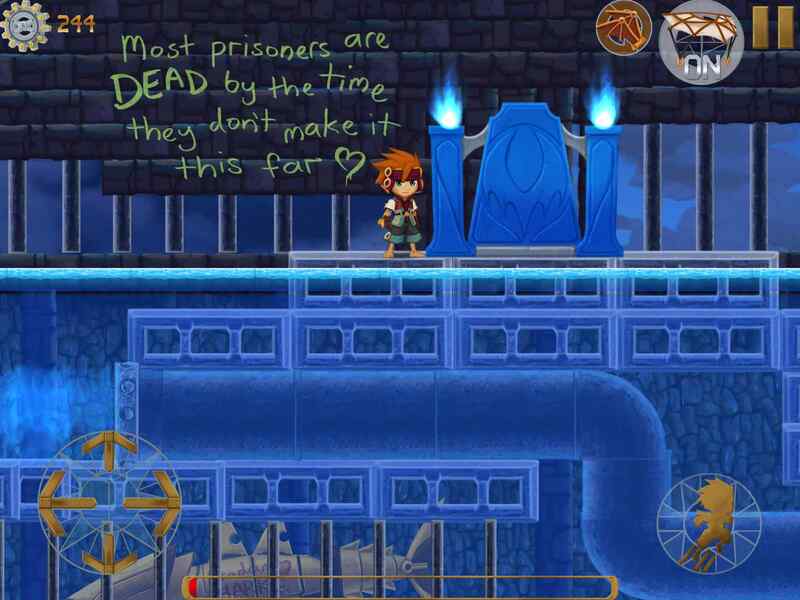 Levels are mostly linear, with occasional choices between two routes, advertised as “Easy” or “Hard” by the wall scribblings of your captor, so don’t put too much faith in the accuracy of the warnings. The linearity, while sounding like a bad point, works in the game’s favour as you never get lost or have to waste time trying to figure out where you need to go next. Overall, this is a great game and I bet you haven’t got it. If you have got it, well done and I hope you’re having lots of fun with it or, if you completed it a couple of months ago, sorry it took me this long to review it. 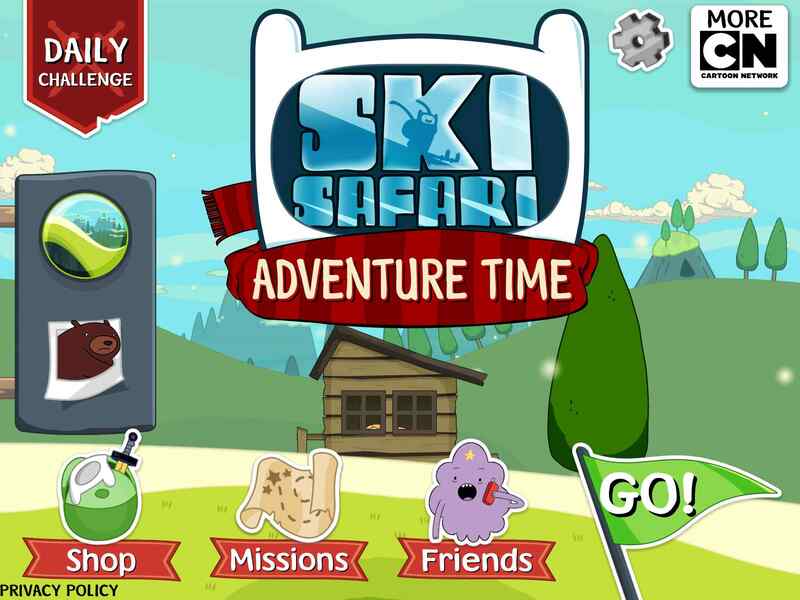 10 word description: Adventure Time version of Ski Safari. Unlockable zones, outfits, power-ups. 10 word review: So much fun, pretty too! Excellent use of TV tie-in. 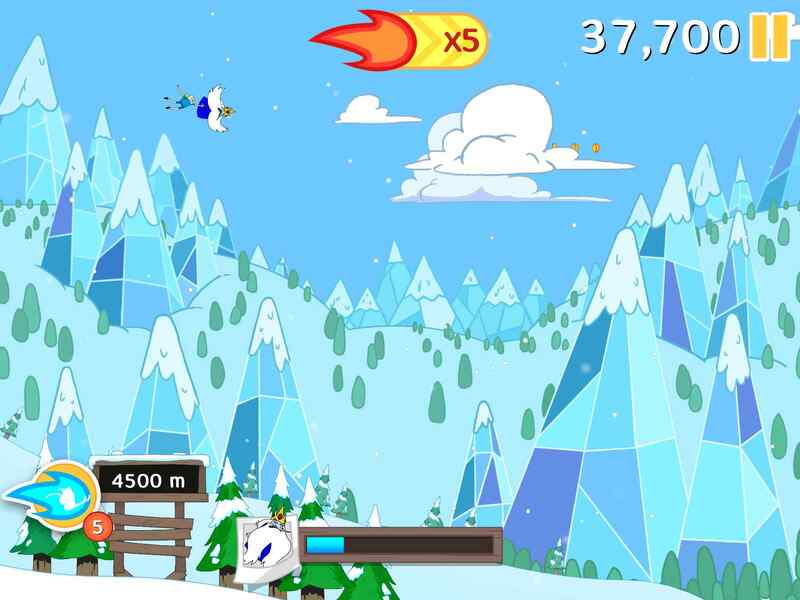 You will like this if you enjoy: Endless runners/fliers/skiers etc. Adventure Time. Surreal scenarios. Surfing on a morphing, talking dog. The good news: Lots of fun. Forgiving gameplay, large cast of bizarre characters, frequently amusing sound effects and quotes. Unlockables are priced quite high but are unessential for progress or to enjoy the game and can realistically be attained just by playing the game – assuming you enjoy it enough to play it quite a lot. Progress (items, score, money, etc.) syncs between devices. The bad news: Performance is poor on 1st gen ipad, which was not entirely surprising, but still a shame for a 2D runner. Arcadelife verdict: I’ve watched the TV show quite a lot – because I have a 6 year old son – and it’s one of those, like Johnny Test, that has enough surreal and borderline risque humour and imagery to appeal to an adult, if that adult was raised on a steady diet of video games and cartoons, and has a warped sense of humour to start with. Saying that, this game doesn’t rely on knowledge of the TV show for its entertainment value. It is a very good endless/distance one-touch game, probably because it is essentially a re-skinned version of a pretty good game. 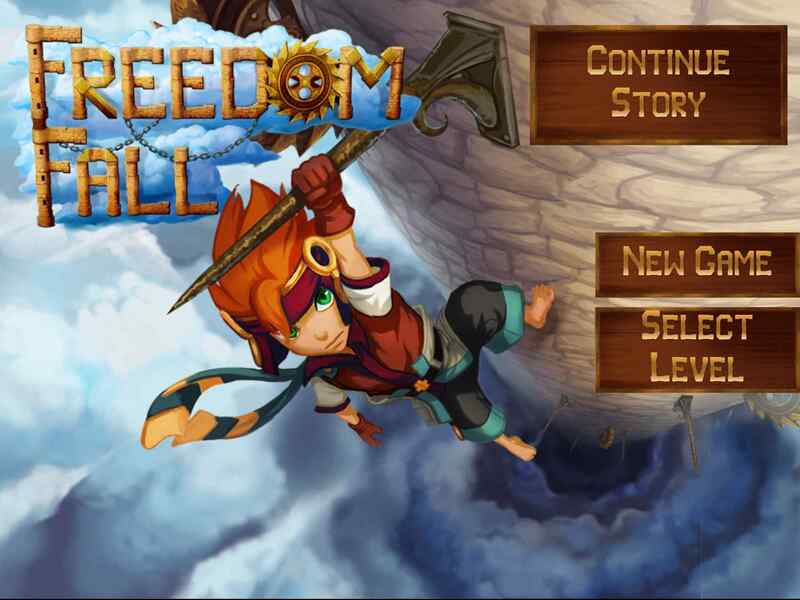 The varied and bizarre characters, attractive backdrops and addictive gameplay work together well. 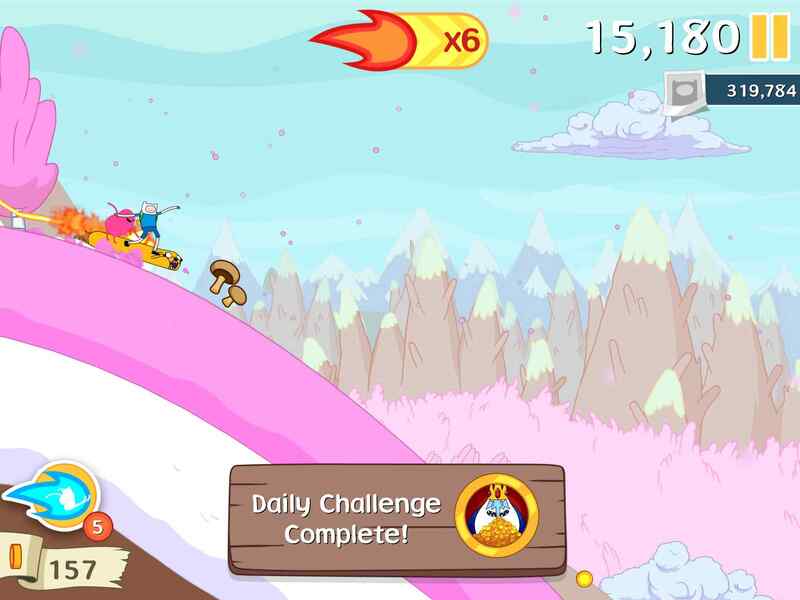 Hurtling down slopes, performing backflips and riding the numerous land and air based creatures and objects is highly entertaining. The only real issue I have is with the high prices of the shop items, which will lead to children (arguably the target audience) wanting things that they can see there but can’t attain very quickly with their game gold. 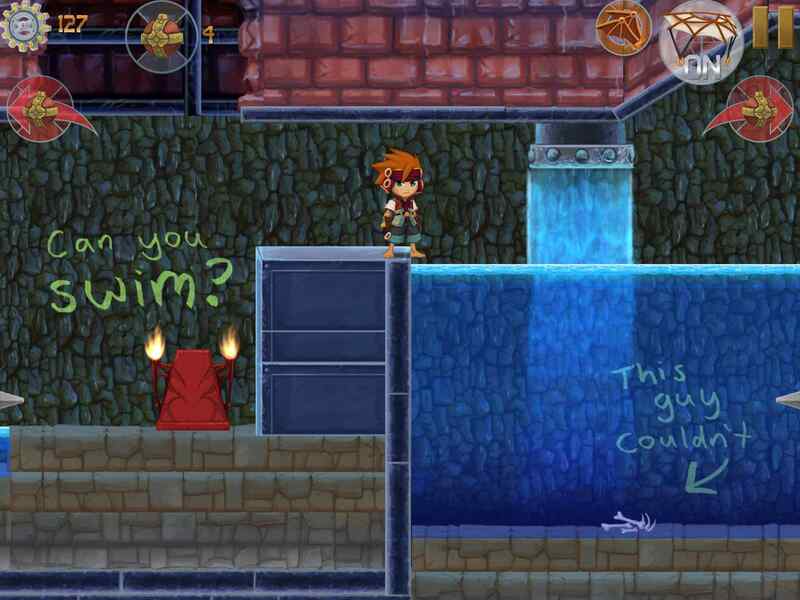 Yes, there are IAPs – of course there are. You are currently browsing the ArcadeLife : Life vs Video Games blog archives for January, 2014.